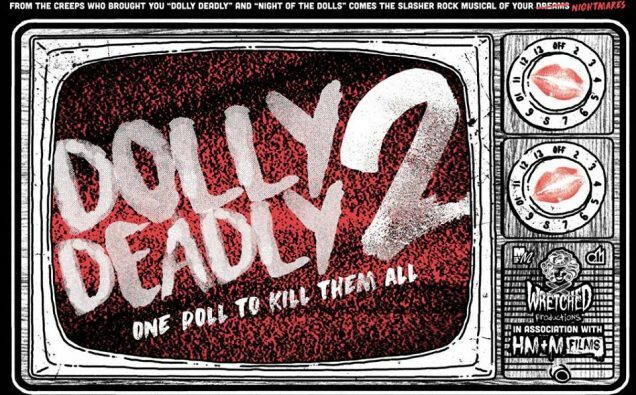 ‘Dolly Deadly 2’ in Pre-Production and it’s a Slasher Rock Musical!! Heidi Moore's Dolly Deadly was a beautifully deranged slasher film- now we see little Benji all grown up and ready to kill! I love the tag line for the upcoming Dolly Deadly musical sequel- “One Doll To Kill Them All!” The sequel to director Heidi Moore’s deranged slasher flick is in pre-production and will need your help! Little Benji is back! Now living as his alter-ego Dolly Deadly, he’s all grown up and ready to kill…again! Welcome back to the trailer park-Paradise Park that is! A place where hot rods and barbecue are the order of the day and punk rock music blasts all night long…throw in a gang of murderous drag queens and a visit to the psychiatric ward, and you’ll get a taste of the new horror-comedy, Dolly Deadly 2. Since its August 23rd, 2016 release, Dolly Deadly has been a success; touring to 20 theaters across the USA, finding its way into 800 homes via the October 2016 Horror Pack, world wide distribution through LeglessCorpse Films and streaming free on Amazon Prime where it’s currently rated 4 out of 5 stars. I am a big fan of Dolly Deadly. The horror comedy about a poor abused little boy who gets revenge, was a visual masterpiece, fun and super gory at the same time! Slasher fans who haven’t seen it yet, need to check it out! Click here to see my review from last year. Director Heidi Moore is the owner of Wretched Productions and has been working in the horror and cult classic medium for many years; making a name for herself in the independent genre film community. Dolly Deadly has been making waves among the horror and art film lovers alike and has been called the weirdest movie of 2016. Now we have a new film in the works. Influenced by John Waters’ Cry Baby, Dolly Deadly 2 will be a carnival ride full of original songs, murder, revenge and roller skating Drag Queens, all set to a punk rock beat and a good slathering of barbecue sauce! All the trailer park wackiness you’ve come to love and of course plenty of blood and guts…it is a slasher after all. The Dolly Deadly 2 team is just getting started and will need horror fans like you to make this film a reality! Wretched Productions and HM&M Films have both worked on several micro budget films and believe that with their talents combined, they can accomplish great things with a small amount of money. They are seeking approximately $10,000 to produce this movie. This amount will both allow them to create all the visuals they have in mind, and will be frugal enough to make back with sales. So far they already have in place: a talented in-house crew,their own equipment, and have several actors standing by ready to get involved with whatever we have coming up. With those aspects of the film already covered, they can focus the funds they seek on the actual production. Both production companies have completed several projects and are fully capable and completely driven to see this project to the end. They just finished recording the music and here is a sneak peek! So check out all their social media to keep up on the film. Dolly Deadly 2 Facebook, Wretched Productions Facebook, HMM Films Facebook, or HMM Films Website.